This is a follow up guest post from Geoff Cooper, Director of Economics at PwC, on work he’s done looking at viewshafts. You can read the first post here. I’ve had a lot of feedback on the results of our study into Viewshaft E10. A common one, including from readers of this blog, asks what the full cost of E10 might be if we include the city fringe and wider economic benefits. I eluded to this on Nine to Noon a few weeks ago, when I speculated the full cost to the area could easily be double. In this post I am going to show how incorporating these issues could lead to a policy cost as high as $3.1 billion. Roughly half the land impacted by E10 falls outside of the city centre. Much of this is in Newton and Mount Eden. In a perfect world, we could include this land in the cost estimate by multiplying the area by the policy effect (already calculated at -2,419 per square meter). However, this requires an important assumption, so here it is clearly stated: We need to assume E10 is the binding constraint to development. Is this a credible assumption? Town Centre zone: Provides for “buildings of between four and eight storeys, although there may be special circumstances where other building heights are appropriate”. Mixed Use zone: Provides for “a range of possible building heights depending on the context. Provisions typically enable heights up to four storeys. Greater height may be enabled in areas close to the city centre, metropolitan centres and larger town centres”. Residential zone: Provides for low density residential. The first two zones provide ample discretion, which leaves us in the hands of individual planners. But the wording gives good reason to think E10 is in play, especially since Newton is so close to the city centre (note: if E10 is not binding, it is a policy attribution issue). The residential zone is clearly more binding than E10 however. If we remove E10, we won’t see more housing in Mount Eden – so we exclude all land in the residential zone. Overlapping viewshafts: ~70% of affected land. Cost attributable to E10 or another viewshaft. Stripping out public land and low density residential leaves an additional 366,144 square meters under E10. This equates to a cost of $886 million with 30% attributable to E10 (270m) and 70% attributable to either E10 or one of the other four viewshafts (620m). Do we have the E10 land impact right? If you take a close look at the view of Mount Eden as it was designed, you’ll notice a building piercing E10 (see Figure 1). It’s the newly renovated SKHY building on 5 Hohipere Street, built before E10. It’s probably a terrible annoyance for E10 advocates, but for the rest of us, it’s a unique and rare glimpse into urban life without E10 (see Figure 2). We can think of land under this building as a control (unconstrained from E10). The land around it is the treatment (constrained by E10). Figure 1: SKHY piercing E10. 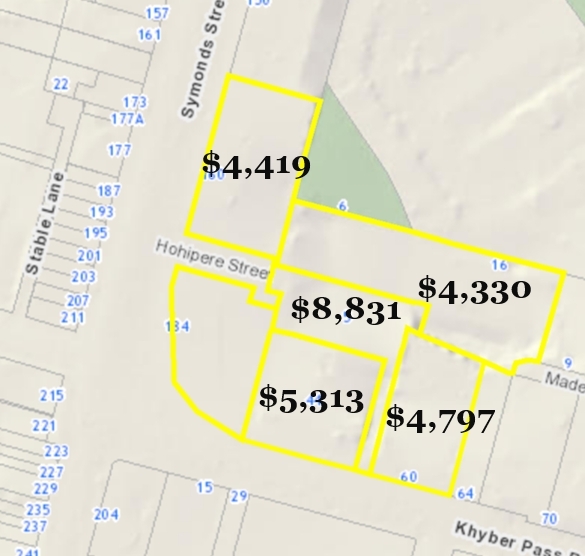 The land value of 5 Hohipere Street is about $18.4m and its land plot size is 2,083 square meters. So land per square meter is $8,831 (see Figure 3). In comparison, adjacent properties are between $4,330-$5,313, a difference of around $4,000. It seems reasonable to attribute this to E10 because the land plots are otherwise similar: both are in the mixed use zone, with largely identical locational amenities. The difference is 70% higher than our study (which we use in the fringe cost estimate) and is striking evidence of the effect of E10 in the city fringe. The policy is clearly preventing people from accessing the city fringe. Land values are lower as a result. Next we consider Wider Economic Benefits (WEBs). I spent much time debating the inclusion of WEBs in the City Rail Link business case review back in 2011. While the City Rail Link brings people into the city though, E10 locks them out. It’s time to start applying this widely agreed and tested source of benefits to our city’s regulatory policy. Agglomeration economies have been well documented over the past century. The continuing intensification of cities proves the increasing relevance of agglomeration economies in the 21st Century. Agglomeration economies flow from business being able to interact easily with each other. They learn from each other and innovate to develop new products and open up new export markets. Workers presented with a large pool of jobs should be better matched to their roles and hence become more productive. There will be informal transfer of knowledge between skilled workers further boosting innovation and productivity in the long run. As the economy of Auckland becomes more and more ‘knowledge-intensive,’ agglomeration economies should become increasingly important. The CBD is the preferred location of these knowledge-intensive industries. Effectively, growing the Auckland CBD will help generate more income for businesses located there and more taxation revenue for Central Government. So we can’t add WEBs for risk of double counting. How much double counting? We don’t know. When employment increases in the city, it raises the productivity of all employees. That’s what makes it an externality. So relaxing E10 could lift land values everywhere in the city centre and city fringe – but our evaluation only considers uplift under E10, making it a partial land value assessment only. This is an analytical area in desperate need of attention. Land use regulation (and section 32 analysis) is not held to the same standard as transport appraisal, despite the glaring similarities. What might be the magnitude of WEBs? We can use the CRL business case to get a sense, since the CRL addresses accessibility and productivity in the very same area that E10 excludes people (these two policies actually oppose one another because E10 directly impacts the CRL stations). WEBs are 37% of CRL conventional benefits. By comparison, other urban transportation projects vary from 16% (Melbourne East West Rail Package) to 56% (Crossrail). Using the CRL as the point estimate, WEBs from removing E10 could be up to $901m. Because of the double counting issue, we include this as a range, 0 – 901m. After taking account of sightline benefits, the net local policy cost is between $1.6-3.1 billion. Methodological gaps increase the uncertainty of our estimate (the lower end is not dissimilar to our original estimate) – and highlight an area of future work. In a perfect world, we would have a much larger sample size to use, a more established methodology for including WEBs into regulatory appraisal and a sharper focus on policy attribution. But this is why the total cost of E10 could be far higher than $1.4bn. As I have said before, I cannot think of another single policy that is constraining our city centre more. So, how did the SKHY building get approved if it’s in the view shaft? It was built before the viewshaft was put in place. A man who knows the cost of everything and the value of nothing. Geoff, it seems there’s little doubt that the viewshaft constrains development and therefore drives down land values. However, I’m struggling to see who benefits from its removal other than a few landowners who are probably already pretty rich (given they’re landowners in central Auckland). I think you need a stronger “public benefit” part of the argument. Maybe half the extra value gets taxed and used to build nice parks, for example. Thanks Jason. Quite right. The focus has been on demonstrating value since the extent of that was not known. Of course, we can capture value for public works in many ways. You’re right that this discussion is missing. Let me also say though, high land values reflect the benefit of urbanisation and that is precisely what you need to drive market based intensification. And the benefits of intensification are well documented: better amenity, higher wages, employment, lower transport costs, lower environmental cost etc. That is why people live in SKHY. People live in SKHY, and the land values are so high, because of the E10 viewshaft. It has meant that his building now has incredible views which are protected. If the view shaft had not been there then development would have sprung up around it. You could equally use that building as a justification for keeping the viewshaft. And who benefits from them being in place? Motorists over the bridge? Removing emotive arguments, be truthful and ask yourself if you really get true and regular benefit from the view shaft vs the urban form of 10 story L shaped squat buildings of Hobson and Nelson Street, all piled on top of each other build due to these restrictions whilst maximizing land use. Not saying we can’t have veiw shafts, but there should certainly be a detailed review from Council and Government…of course there won’t and nothing will happen. Agree with Heidi, interested on a review of the Character overlays of Western suburbs. Geoff, have you done a similar analysis of the cost of the heritage overlay? And is there enough data yet to look at the cost of the silly THAB rules that require ships to be built instead of terrace houses and apartments? Those would be more interesting to me, as I think in a world of uncertain energy future, we should probably be restraining ourselves to four or five stories anyway, but over a much larger part of the city. +1000 to three to five storeys over a larger part of the city. The future is three storey walk-up apartments! What does this mean, for the uninitiated? Deep, narrow “traditional” lots + restrictive recession planes on side boundaries = multi-storey versions of the 1960’s sausage blocks, long rectangular buildings at 90 degrees to the street, with much of the outlook sideways towards neighbours. Without the recession planes, or with better crafted controls along side boundaries, terraced house groups facing the street would be possible. Yes, and facing back gardens / communal spaces too. They enable the best ratio of permeable / impermeable land. New Zealand’s electricity is already about 80% renewable and we have incredible opportunity to increase that as the cost of solar energy plummets. Although there’s plenty of uncertainty around the world’s ability to adapt to climate change, I don’t see how we have any uncertainty around sourcing electricity in new Zealand. There is no need to limit high rise development, which helps to create a vibrant and exciting city center. Part of the value of the SKHY is because its views aren’t blocked by similar height buildings around it, of course. That is exactly right Heidi. Viewshafts often have winners whose views inspire them to become advocates of the viewshaft, (for the public good of course). The two problems with studies like this is they show the value lost at current prices but those prices will change significantly for every land owner if the policy wasn’t there. A second they never value the benefit side. Some one is scoring a windfall, how much is that worth? That said I would be in favour of removing all viewshafts on the grounds of equity. If you want a view then buy the land at the front and pay the price for your view. I guess, miffy, studies like this are very important in increasing understanding that regulation is a big player in who wins, and who loses. Perhaps the surrounding buildings also have lowered value due to SKHY blocking light? That’s exactly right Heidi. We account for that in Sightline Benefits, using the same methodology in the first study – so it is in the net figure. If we removed E10, the supply of high density develop-able land would increase, so total supply floor space would increase. Given demand is same and supply increased, the value of average land would decrease. So actually this analysis assumes that if the entire area under the viewshaft gets developed, then all those apartments will also get the same incredible views (and thus the same value). Tell me again why should I think that economy is more than just a bit of quack science for the rentier class? I agree remove E10. Put a levy in place for those properties if they choose to develop to account for the uplift in value they gain from its removal. Just wondering why no value for the corner property which is highlighted in yellow on Fig. 3? An omission – i’ll post the number a bit later. Thanks. I just went on the council GIS and totted up all of the land values I could find for that lot and divided by the area. I got $5767/m2. (Caution: I only did this once and there may be data entry errors, or I might be missing some component). But I see you’re making adjustments to arrive at a net figure. Would be interesting if you could please show your working for this one? Cheers. Also, could the value of the lot in question be higher because the driveway and carparking for it is on an adjacent lot (whose value might be reduced accordingly)? Geoff, will you be able to answer this question? Or post the missing detail in the question above? I’m also wondering whether there is an account that would need to be made for any costs for infrastructure provision (water, sewerage, transport, schools) if one were to increase building density? The number may still be positive, but shouldn’t your analysis factor in these costs as well as any value increase to a piece of land which may benefit from them? So if other parts of Auckland would allow us to go up (looking at the character protected suburbs) we wouldn’t have to block the views of and from our maunga. 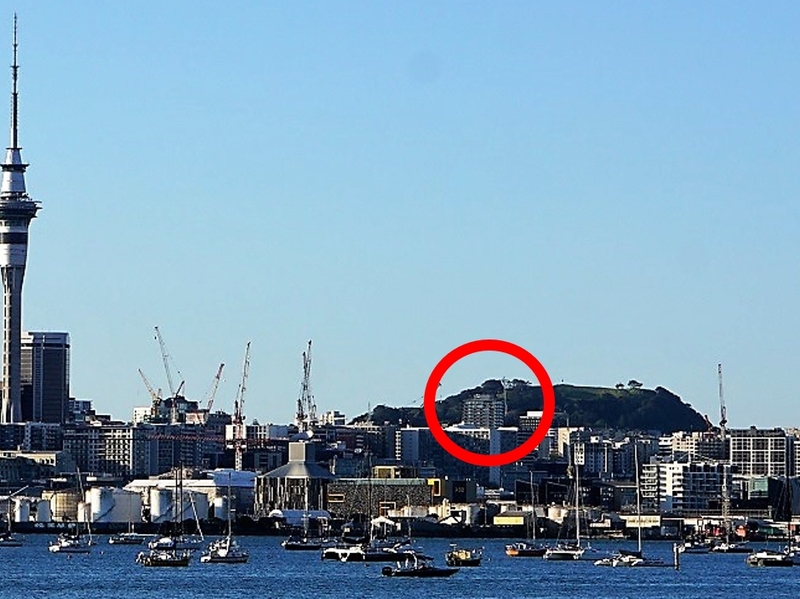 Until everywhere in Auckland is going up to five stories, there are bigger fish to fry. Really? You can’t think of another and bigger elephant in the room bigger and way more problematic than Viewshaft E10? So, what about the [NZTA] policy that persists with leaving the motorway corridor “as-is” that strangles the CBD into its present form because of an open traffic sewer? Viewshaft E10 only is a “problem” because the CBD is constrained into a very narrow area. Most CBD can and do spread out in a more linear fashion. So there is a lot less land to build on making the difference between the haves and have nots under E10 more stark. But its an artificial creation, just like E10 is. Whats do you reckon the “value” (WEBs and all) of that land currently lost to the motorways in the CBD and fringe areas? And whats the value of the disbenefits in terms of constraints it puts on the CBD area. Land that is currently valued at $0 as it has a motorway through it? If you want to start chucking rocks at “policy” glasshouses, then why not start with the biggest and most momentous glasshouse there is? The one that is the true problem here, not the strawman one of Viewshaft E10. Look forward to your analysis on the same basis of how much that has cost and continues to cost the entire region. Completely agree but you are talking about a physical policy vs a written policy. It’s fairy easy to remove a viewshaft, not so easy (or cheap) to dig up a motorway and even if you did, the CBD would not spread out due to the insane number of NIMBYs. If you struggle to build 4 level on Dominion Road I think you’d struggle to see the CBD keep shifting laterally towards the inner west…again, back to those blanket character overlays. Grafton Gully could certainly be built very densely but again, the Ports of Auckland trucking would have to use some sort of road. Sadly, we are restrained by multiple policies all working together to limit land use. We have Manukau, Albany and Westgate unrestrained by such rules, what’s their excuse. How many more people do you want to cram into the Westgate area with no firm plans or timeline for LRT or even a busway on the North Western? Start by stripping the character protections from inner city areas with Link Buses and gold-plated PT or take those services away and give them to people who will actually let their area develop. Or strip their residents’ parking zones away and convert them to tiny house communities. They’re not central. You could have unlimited height restrictions and no minimum parking requirements in Taihape (for all I know it might already be the case) and there wouldn’t be a sudden boom in construction. That first photo is a really convincing argument to keeping the viewshaft. But what’s the argument? Can you elaborate?? At least the discussion provided by Geoff provides data, value and reasoning, whether its right or wrong. Just saying a photo, which to some visitors is just a grassy hill is convincing really needs some detail behind it. That photo is also quite a convincing demonstration of how the viewshaft is limiting development. On the other hand, there are absolutely draconian restrictions of development in nearby areas. Would building up so high make any sense if a sane level of development were allowed over a wider area? Thanks to Geoff, we can now attach an actual monetary value to that view. The argument is that public ownership of a billion dollar asset should be up to the public to decide on what they value. Not everything of value can have a price attached. Everyone using Sky path will have that view. Let the public decide if they want to give up a billion dollar public asset and give it to a bunch of rich developers to get richer and so a bunch of rich people can have expensive apartments in Wynyard. No emotive arguments there. Its about public ownership of a public asset. I suppose if the public decides they want to “sell” it, they can do so. An interesting think piece, but what is your motive for this report? It would seem to me the ‘benefits’ to removing the viewshaft are primarily for landowners who can profit by building higher. And if we are to accept that we [as a city] could benefit by having higher [and taller] density of land within the view shaft on the ‘CBD’ side then is the same not true if we remove height restrictions on the other side? I didn’t expect GA to be promoting an idea that will enrich private landowners; however it would make sense if GA were tying it to another idea they’ve promoted: a capital gains tax on land value uplift due to zoning changes. Also, I’m surprised no-one has been able to photoshop an image to show what it would look like without the view protected. And maybe one from the top of Mt Eden so we can see what harbour views we lose. This is the nature of the beast when you have a huge housing crisis. Developers aren’t a charity, but if we can’t enable them to build (in Brownfield sites) then we will continue to have a housing crisis where ‘Auckland’ homes are being built in Waikato. The greedy developer line is the same line NIMBYs use to try and block the Panuku Development on Dominion Road. Do we really believe in 40 years or so, when Auckland is swelling in size and we are literally bursting at the seems that this view for cars going over a Bridge will be worth the land restrictions? Thanks for the comments John. I realise I have not described the distribution of benefits. That fell outside the scope of work because it depends entirely on other policies. Instead, I focused on demonstrating value and who the winners and losers are. That said, I would question the idea that all benefits to optimizing E10 go to land owners. Landowners do benefit, but so do others. Developers buy the land because they see value in the transaction; similarly, final consumers (homeowners or businesses for instance) transact because they see value. It’s no different to any other value chain. In economics, this is called consumer surplus. We are all living in houses that were built by developers. We pay the costs because we want to live in Auckland and have access to the benefits from that: family and community, good paying jobs, amenity value etc. Giving folks the chance to access urban life is a strong motivator for many urban economists and planners. I repeat my comments from the first article. This analysis points out exactly what is wrong with the application of the RMA. There is simply no positive socioeconomic cost benefit justifying the view-shaft rule. All planners should be forced through RMA amendment to undertake such economic/social/environmental analysis individually for every single rule they wish to include in any RMA planning document. (the current overall S42 analysis in comparison is a joke). The mere fact that substantial analysis is required for every rule will limit the implementation of new rules to those that are necessary, and not the pages and pages currently produced. The RMA amendment should also require existing rules to be retrospectively analysed – those failing to provide net economic/social/environmental benefits should lapse. A few people have already said this, but I’ll reiterate. At least in urban areas, the default should be no development restrictions at all. If the council want to introduce rules then they should have to include written justifications as part of their district plan and expect to defend them in court. Some of the viewshafts will be defensible as culturally significant for tangata whenua. Most won’t and should be removed. Most importantly, the general heritage overlay would be gone. Sigh – like many other comments about the impact of planning on urban development, this is extreme libertarian ideology masquerading as analysis. It starts from the position that there is underlying right to privatise amenity and then looks at the “costs” of forcing developers to internalise that cost. There is no analysis of the benefits of viewshafts or amenity generally nor any sense that this public good has been protected through the democratic process. I am increasingly frustrated by the argument that requiring property developers to take account of the wider impacts of their actions is somehow imposing a cost – in fact, it is simply ensuring that those who stand to profit have to factor in the true costs of their actions. The democratic process shapes the parameters, including the property “rights”, within which economic activity occurs. If the democratic process is going to bring regulation change to enable housing development in central areas, the public will need to understand the effects of current regulation. Do you not think analyses like these help with raising awareness on the topic? Do they simply need broadening of scope? What better methods of raising such awareness would you recommend, and why haven’t they worked to date? Can the democratic process help set an overall direction, allowing Council to direct how that applies to regulation in key areas, such as the inner west, against the local democratic voice? Thanks Heidi. For me the core problem is the starting point. The “costs” here aren’t costs in the sense most people would understand the term; they aren’t even opportunity costs. Rather they start from a false counterfactual and are then used to create a sense that there is a large :”cost” to a regulatory device such as a viewshaft. Views are public goods and public property – you could I suppose use these numbers as an estimate of how much a developer might be willing to pay people to compensate for the loss of view forever. You’d then need to know how much people might need to be compensated for the loss of such views in perpetuity. But in general this type of pseudo-quantification is a rehetorical device rather than an analytical one. To even go there one has to start from the principle that property owners ought to be able to do what they like and any imposition on that is a cost – hence my use of the term “libertarian” 🙂 The purpose of such analysis is to create the idea that certain regulations are creating a “loss” in some sense – however the article doesn’t in any way establlsh that there is any loss in a welfare sense beyond certain people having to think more broadly in the way they do things. These same arguments get applied to whatever is the issue de jour by people who want to elevate private property rights ahead of democratic restraints on economic activities. As i’ve said before I don’t think there is any real issue with the planning system: there is a large amount of land available, even on the isthmus, and huge opportunity to create new communities without dismantling existing ones, destroying heritage values and trashing green space. This is why I found Mark Todd’s article so inspirational. The core issue I think is that developers and banks are very risk averse! A bit like the market being one tool we can use if we choose, rather than being a “baseline” natural position, which it never has been, and never will be. What useful analytical technique would you use to demonstrate the effect that not intensifying the inner west has on welfare of our people? Would you look at the NIMBY regulations and their effect in a similar way to how Geoff has looked at the viewshafts? What would be useful for changing the mindset of the people who live in these wealthy suburbs? Libertarian economic analysis, however ill-conceived, or an appeal to their social conscience that we can provide better for the majority of people? What do you see as NIMBY regulation in the Unitary Plan? Why would profit orientated developers provide a better long-term solution if there is less regulation? What exactly in the Unitary Plan will stop the West intensifying? Could it be that the West will intensify or not depending on whether there are more developers like Mark Todd for example. Hopefully the Unitary Plan will nudge that somewhat towards higher quality. When you look at the detail – I had a look at the Unitary Plan and some time ago I engaged with a colleague of Mark Todd’s -, the “NIMBY regulations” people talk about are most often things like the Building Code requirement to have lifts above a certain number of stories. The Unitary Plan isn’t really an issue. Where is the hard evidence that it is a problem rather than an asset in terms of making things better for the majority of people? I am very concerned about getting quality affordable housing for more people, but I have yet to see evidence (as opposed to the rhetoric) that the planning system is a major barrier to that. I agree that individual planners and developers can be conservative but that is about leadership in my view. I am not opposed to regulation, but to the specifics of the Unitary Plan which, while a big step forward from what we had, is still enabling greenfields development and hindering quality intensification. Do you not consider the Residential – Single House Zone to be a hindrance to intensification of the Inner West? Nor the Heritage Character Overlay? For a specific example, Cohaus http://cohaus.nz/ The planner recommended turning it down. 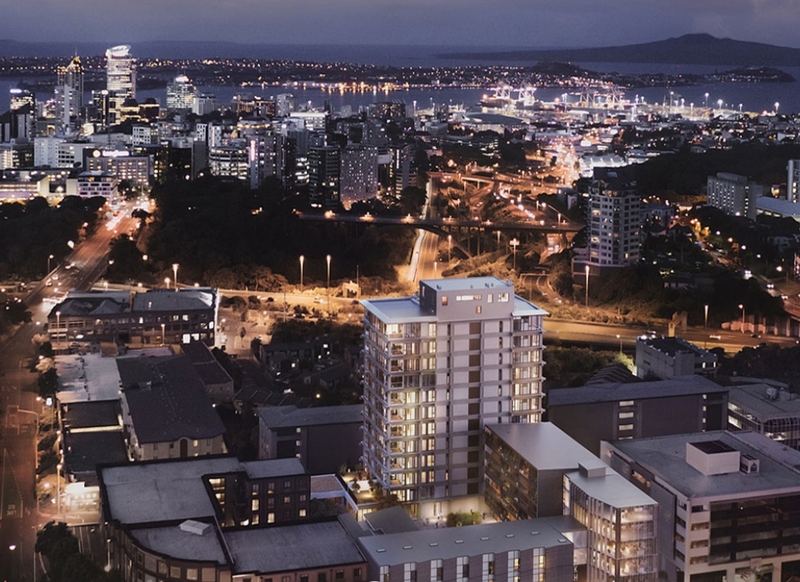 Despite all the positive social, environmental, transport, and aesthetic reasons for consenting it, the zoning under the Unitary Plan has made the proponents have to jump through hoops. I don’t know where it’s got to now. The THAB zone, similarly, doesn’t allow for THAB. It allows for ships, as discussed above. For another specific example, a friend wanted to develop her property in the THAB zone, using the perimeter block housing format, and couldn’t. She would have to have ruined the back yard. The neighbouring property was for sale, and there were possible buyers who were discussing doing the same. As it was, no one property could be developed like that, so none of them will be. Maybe Ockham, with several sites together, would have been allowed to build something with a better form, but the AUP doesn’t allow quality form to be built property by property. And that’s a problem. The zone that covers the most area, the Residential Mixed Housing Suburban, allows for two storey development. What kind of intensification does that allow? Sprawl, car dependent development; infill generally, with loads of driveways and car infrastructure. There is no zone that enables quality perimeter block housing. And meanwhile the RUB has to be set to ensure there’s enough land to provide 7 years’ development. We already have enough land to provide 7 years’ development. We have enough land to provide 50 years’ development, so what does this mean? Auckland has covered too much land. We now need to intensify. Why on earth would you be adjusting the RUB to provide more land? It’s mad and it’s in the AUP. Planners and developers being conservative is one thing. Council planners refusing consent to quality form and to quality projects – that should have been made impossible by the AUP. That’s a very good article. Todd is pretty inspiring. Thanks for the above comments – I really appreciate the detail and will have a proper look before replying. Please don’t feel I’m ignoring this if it takes a few days. Are people putting too much weight on the idea that needing resource consent is a barrier. All that says is that some aspect of the public interest / effects on others needs considering before you go ahead. When you say “a friend wanted to develop her property in the THAB zone, using the perimeter block housing format, and couldn’t.” – what does “Couldn’t” mean here? One question – I haven’t had much success navigating Auckland Council website to find Officer’s reports – do you know if there an easy way to find the Cohaus one? It may be that people are putting too much weight on the resource consent being a barrier, yes. In the same vein that the people opposing a HNZ development are arguing that “first they changed the AUP to allow four storeys! Now they’re pushing it even further by applying for 5 storeys! We have to stop this!” Most people think that development rules are there to protect them and consider the developer to be a bad sort if s/he applies to go further than the rules say they can. For Mum and Dad deciding to develop their property, they tend to limit themselves to what’s written in the plan. The unknown costs and outcomes of hearings and so on are too risky for a one-off development, otherwise. What I don’t know is if the commissioner’s decision is out yet. And presumably you’re aware of the Panuku development on Dominion Rd that was turned down, to the disgust of the Dominion Rd Business Association, amongst others. Noted Matt. Thanks for the feedback.